CAPE CANAVERAL, Fla – SpaceFlight Insider has received a report that NASA’s launch of the Deep Space Climate Observatory (DSCOVR ) mission has slipped to no-earlier-than (NET) Feb. 8, 2015 at 6:10 p.m. EST (2210 GMT). No details have been released as to the cause of the delay. The launch window for the mission is instantaneous. A SpaceX Falcon 9 v1.1 rocket has been tapped to launch the DSCOVR mission from Cape Canaveral Air Force Station’s Space Launch Complex 40 (SLC-40) in Florida. DSCOVR is a joint NASA-NOAA mission (along with the U.S. Air Force) which is designed to study solar activity and provide early warning of dangerous solar events that could impact Earth and space-based systems. The mission has already cleared the Key Decision Point C Review, suggesting that the delay could be related to the launch vehicle itself. DSCOVR is currently managed by NASA’s Goddard Space Flight Center in Greenbelt, Maryland and, when deployed, will orbit at the L1 libration point. This is the location in space where the Sun’s and Earth’s gravitational pull cancels each other out. L1 is approximately one million miles away from Earth towards the direction of the Sun. If everything goes according to plan, the spacecraft will be able to provide crucial data on solar flares which could cause an estimated $1 to $2 trillion in damage to systems such as the Global Positioning System (GPS), air travel, satellite operations as well as human space exploration efforts. Through this partnership, NASA utilized NOAA funds to refurbish DSCOVR satellite and instruments which were placed in storage for several years. NASA is also working on the ground support systems for DSCOVR. DSCOVR has a long and interesting history. Initially dubbed “Triana,” after Rodrigo de Triana, the member of Columbus’ crew who first spotted land, the mission was scheduled to fly on STS-107, the ill-fated final flight of space shuttle Columbia. The satellite cost an estimated $100 million and was placed in storage throughout the course of President George W. Bush’s time in office. In 2008, the mission was taken out of storage and renamed DSCOVR. Both United Launch Alliance’s Delta II and SpaceX’s Falcon 9 rocket were suggested to fly the mission – with the F9 getting the nod. SpaceX has stated plans that it will conduct the next attempt to land the first stage of the Falcon 9 v1.1 on a automated ship placed out in the Atlantic Ocean off the coast of Florida – on the DSCOVR mission. During the Jan. 10 attempt, the first stage came very close to landing on the autonomous spaceport drone ship (ASDS ). However, the booster struck the side of the ASDS, which caused the remaining fuel to ignite, thrusting the booster over the side of the ASDS. 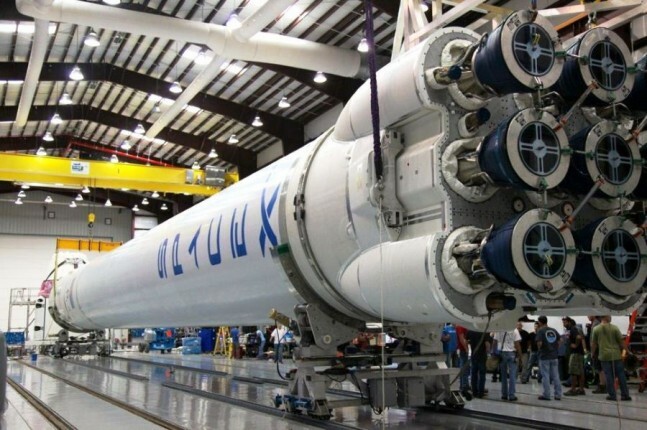 I didn’t expect to see the falcon 9 1.0 as the lead lead image here rather than the current version but oh well. Still a good picture. Side note, I watched the live coverage tonight, audio was dodgy (in and out) but it was nice to see the live coverage.